Quintessential sambar can be made more interesting by adding specially prepared spice powder. Podi sertha sambar (பொடி சேர்த்த சாம்பார்) is another type of sambar, the taste of which is enhanced by freshly made masala powder. 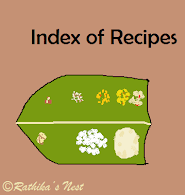 *Ash gourd (white pumpkin), yellow pumpkin, brinjal, ladies finger, drumstick or sweet potato may be used, either alone or in desired combinations. It is preferable to use radish alone as it has a specific flavor. Method: Wash toor dhal well, add 400 ml (two tumblers) of water, and pressure cook for 6-7 minutes (6-7 whistles). Soak tamarind in warm water. Heat ghee in a kadai and fry dhania and methi seeds for a minute. Add asafoetida to the kadai and switch off the stove. Once cool, powder these ingredients. Heat oil in the kadai, add mustard seeds, when they start to sputter, add split urad dhal and methi seeds. Fry till the dhal turns golder brown. Add the cut vegetables and required salt. Cover and cook on a low flame. Meanwhile, squeeze the tamarind and extract the juice. Add the sambar powder and jaggery to the tamarind juice, mix well and keep aside. Once the vegetables are done, add the tamarind juice mixture and bring it to boil. Allow the mixture to boil for 1-2 minutes. Mix the dhal using an ordinary hand blender or a ladle till it is soft and uniform in consistency. Add the dhal to the boiling kuzhambu and mix well. Now add salt and bring it to boil. Switch off the fire. Sprinkle the prepared powder on the sambar, stirring continuously to avoid lumps. Allow it to boil for a minute and then switch off the fire. Garnish with curry leaves and coriander leaves. Serve hot with rice and curry/kootu/ appalam.